A common device that I see a lot of is ‘stagger breathing’, and I have some problems with it! Not the concept itself, just the way it is carried out. I often see a stream of notes in a woodwind part, perhaps copied and pasted from the violin part, and the words, ‘stagger breathe’ or ‘breathe when necessary’. The latter I find particularly humorous, as they really have no choice. Even the world’s most intelligent flute players have no way of knowing the best way to break up a line until they have heard the piece a few times or looked at the score. Rehearsal time is at a premium these days, and now the players are going to waste that time working out something that the orchestrator should have done for them. A more common scenario in my world is that we are running behind and pull up the last cue in a rush with no time to work anything out; we have to record now or we will go into overtime. There is a really good chance that the winds will breathe together, since that is the default we rely on from them the rest of the time. Apart from the pitfalls mentioned above, another problem I have with just telling the players to handle breathing themselves is that you are missing out on some great creative opportunities. As I will demonstrate, you can use the switching off and dovetailing to your advantage, creating colors and textures that would not happen if you just left the decisions to the players. Here is a common type of line that we would want the flutes to play. Lets imagine it goes on for a while. I have kept it simple for this demonstration, but in the real world the notes would likely move about a bit too. There are many ways this could be broken up. 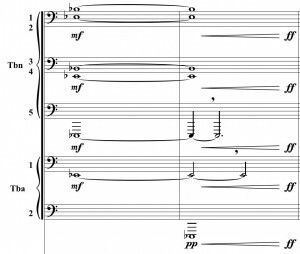 At this tempo, the flutes could easily make it four bars before breathing, and if you did not mark anything they would probably grab a breath at the end of the fourth measure. I notate where I want that break, as I’ve done below. The players will breathe separately and nobody has to say a word to make it happen. Note that the louder the dynamic, the more air required. Going too long between breaths may force the player to hold back a little in order to make sure they can play the phrase. Therefore, if you want a powerful sound, you should allow the players more breaths. The next most common way to write this is to split the line. I have often seen some people do either of these two options. The problem with these is that they do not overlap. When splitting up lines it is a good idea to dovetail the entries. If you do not give the players a target on a beat, you run the risk that they will rush the line, and there will be a gap before the next player takes over. Here is a better way to do it. This fixes the problem, but it does not bring anything new or interesting to the music. This solution solves the problems and brings something new to the music. Now we have a nice pulse going, the players have lots of little gaps to breathe in, but they are short enough that they can get into a groove so the timing will be good. This is the solution that I use the most. Add an accent to the start of each cell to exaggerate the effect. You will notice that I tend to use long slurs for each phrase. If this were for the violins I would probably have a slur for each beat, but it is important to remember that woodwinds are not string instruments. I often see people copy and paste passages from the strings without changing the slurs. Slurs in the string part are for bowing; for winds and brass slurs are for articulation. A slur indicates how many notes are played after each tongue, which is not the same as changing bow direction. I find that for longer phrases, less tonguing sounds better and is easier to play. So do not ‘bow’ your woodwinds and brass. Take note of how I notate the ends of the lines. If they end on a downbeat or an ‘and’ I use an eighth note. One could use a sixteenth, but then you need more rests and it gets messy and harder to read. You could also put a staccato on the eighth, however I do not. It is pretty clear that this is just the end of a phrase and it is short. If the tempo were slow, I would consider adding the staccato, but at this tempo, they will play it short by default. What is not ideal with this writing? 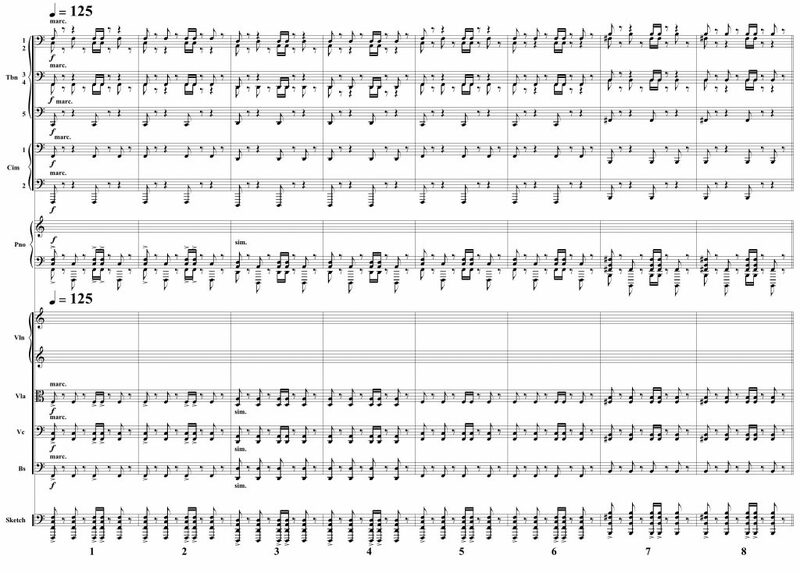 I did exactly as the composer had programmed it in his mock-up (see the sketch staff at the bottom). Also note that this is just the first eight bars, this same figure goes for another eight. It is all playable; however, you will get a weak performance if you make the brass play this much. It takes a lot of air and energy to play this. Take the example of tennis players; they would love to have the force of a strong, overhead smash for every stroke, but it requires a perfect set up. The ball has to be in the right place and the player needs time to get the racquet in place. Similarly, to get a huge attack on a note, a brass player needs time to draw a breath and prepare. If the note has space around it, they are going to expel that power in one blast. If there is no time to prepare or they have to play other notes right away, they will have to use the same air for more notes, thus limiting their power. This akin to the tennis player having to volley. Where possible I like to spread parts out so the players have time to ‘re-charge’. It may seem counter-intuitive to have only two people play at once instead of four, but those two can be much more effective when they are not blowing all the time. Effective orchestration often requires working out solutions to these problems. It is very easy these days for a composer to paste the strings to the brass or use a combination patch. But in the real world, using too much brass can not only make a part harder to play, it also risks diminishing the impact. In many cases strings and percussion can keep a rhythm going and the brass can just hit major accents or parts of the phrase. In this case, I have to have the brass playing every note, as that is what the composer has asked for, but it is always worth considering how much live brass will be appropriate. Break up/hocket the line for the brass. No one plays every note of the pattern. This means they can take more breaths and play stronger. I have used the breaks to my advantage: they only happen on weak beats, while the beats that are accented have everyone playing. We now have natural accents, sparing us need to mark any. Adjust the voicing for maximum impact. I took out the fifth on the weak beats and added a lower fifth on the accented beats. The strings and piano are covering the fifth on every beat; it will not be missed. I call this the ‘power chord’ effect. I used cimbasso instead of tuba as it has a more direct sound and matches the trombones better. This is due to the straight bore of the cimbasso and its forward-pointing bell. Leave more space in the very low end. These notes take way more air to blow. I also took out the low sixteenths. The single note has much more impact and the sixteenths are covered in many other parts. Similarly, take out the sixteenths in basses. They are nowhere near as punchy as the celli down there. The basses just give weight; let the sixteenths come from elsewhere. Note the piano part; written in a manner similar to the brass. A much more interesting sound with more impact than the first version. So far we have talked about moving lines and phrases, but what about long notes? 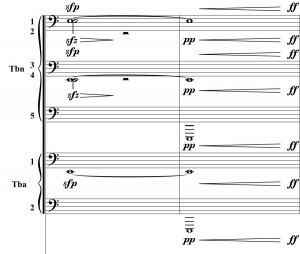 I often get passages where the composer has pasted the cello part into the trombone line, expecting them to play four bars (or more) without breathing. There are two different situations you may encounter here. One is where you know there is no way they can make it without a breath, while the other is when you are not sure. If you don’t mark the breath, they will take it wherever they decide. It may not be in the ideal place and there is a good chance they will all do it at the same time. Here is how I handle long notes. The advantage of this system is that if things change, you have not needlessly broken up a line with rests and dynamics. It is clear that line is continuous, so the player will handle sneaking out and back in again. If you have underestimated the time they can play, they can just skip a breath. Another common scenario is the brass swell. Always keep in mind, the larger the instrument and lower the note, the more breath needed. If you do not mark it, the lower players will sneak a breath, and it may happen at the same time, causing an unfortunate break. I use a combination of tricks to make a brass crescendo work. In this example I give the comma to certain people so they know where to sneak a breath. I did not break Trombone 4; the player will either make it in one breath or sneak one on the down beat. If they do breathe, they are covered. I left Tuba 2 out until the crescendo so it can use all of its energy on the last push. In this example I have everyone on the opening sforzando, then do similar tricks to the previous example to create a huge crescendo. This was very helpful. I’m writing for full-orchestra and the “breathing of musicians” becomes a huge factor in the effectiveness and fluidity of the piece. Very cool – thanks for sharing Tim. Quick question about the final example: do trombones 2 and 4 join 1 and 2 on the E in the second bar? 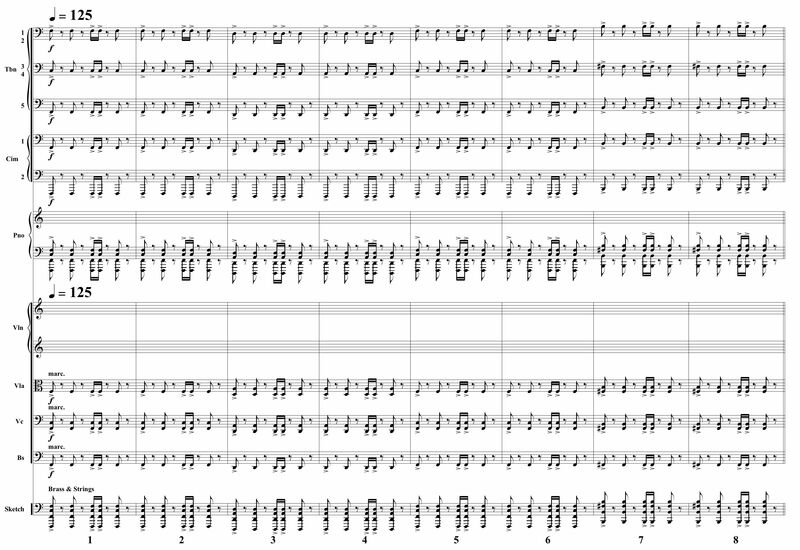 If so, would it make sense to add “1 and 2” and “3 and 4” the second bar of the trombone staves? Or maybe add another whole in a second voice to each staff? I can imagine that they might be confused since they have a half note rest in bar 1, and the ties are for voices 1 and 3 only. Hi Peter, yes they join.I guess I could have made it a little clearer for academic purposes, technically there should be a whole note beside the other one, but seeing as there is no rest in that bar and a new dynamic and hairpin appear, if you follow my rule of a2 unless specified otherwise, the part joins. When it comes to making the parts the copyist would also see that in layer 2 there is another whole note.